After a little break the Bandon Senior Hurlers will contest the Munster Intermediate Quarter Final on Sunday next in Cloughduv at 2pm against the winners of the Waterford final to be played between Lismore and Dunhill. Your support as always will be very welcomed. 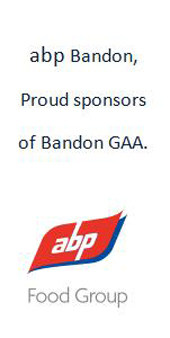 A large crowd from Bandon cheered on the Under 12 Footballers last Sunday at Clonakilty when going down narrowly to a very good Bantry side 3-4 to 2-9 in the League Cup Final. This was a very closely contested game throughout and we had our noses in front 2-2 to 1-2 at the break. The final result was in doubt up to the final whistle, Bandon were full of guts and effort but Bantryâs slight edge in class got them over the line. Best on the day were S McCarthy, P Gaffney, A OâReilly, K Donnellan and H OâMahony. Team: Jack Cullen, Shane McCarthy, Darragh Collins OâBrien, Paddy Gaffney, Eamonn Twomey, Ciaran Twomey, Jack Callanan (Capt), Sean Ahern, Stephen Collins 0-2, Aaron OâReilly 1-0, Kain Donnellan 1-0, Dylan Wilmot 0-1, Hugh OâMahony 1-1. Subs: D Collins & Donnacha McCarthy. Bandon GAA Club salutes the Under 14 A Hurlers who completed the hat-trick of titles when defeating Kilbrittain in the West Cork League Final 5-14 to 0-2 on Monday evening. This title is added to that of the West Cork and County A Championships victories over the same opposition and Youghal in the latter final. There was no winner the GAA Club Lotto last week (numbers 1, 11 25) and so the jackpot is gone up to â¬1,500 for this week.